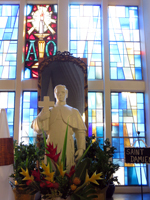 Father Damien Museum Remembers Two Hawaii Saints and the People They Served. Hard to Find but Worth Discovering! 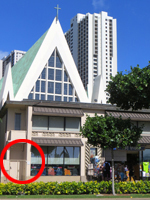 Located across the street from Waikiki Beach near the hula stage and Duke Kahanamoku statue, the museum is actually larger than I expected – occupying the entire second floor of the building directly in front of Waikiki’s Saint Augustine by the Sea Church (above the ABC Store). Nevertheless, the main entry door (left front corner of the building) is easy to miss because the signage is non-prominent, and the door itself looks like an employee entrance to the adjacent ABC Store. Once I found the place, my first impression of the Father Damien Museum was that it is quite large for a museum dedicated solely to the lives of only two people. 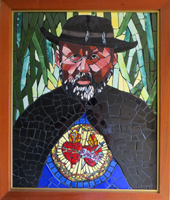 I knew that Saint Damien of Molokai had become famous for selflessly serving the leper colony at Kalaupapa until he ultimately contracted and died from Hansen’s disease (leprosy) in 1889. I also knew that Saint Marianne Cope was renowned for her faithful service with the Sisters of Saint Francis and the treatment of leprosy patients in Hawaii. In spite of that, I wondered how much there could possibly be to display from the austere lives of these two individuals. Thus, I was surprised to discover that a significant portion of the exhibit is dedicated not just to these saints, but also to the people for whom they cared. In nineteenth century Hawaii, leprosy was still an incurable and terrifying disease. People diagnosed with the condition were whisked-away from the rest of the population to the remote Kalaupapa peninsula on the sparsely-populated island of Molokai. There, they lived the remainder of their lives as a sort of untouchable caste. I first became aware of these people’s plight shortly after I moved to Hawaii. That’s when I met Margaret of Molokai and heard her story about growing up in the colony. 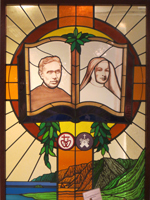 Coming to know these other Hansen’s disease sufferers (through their photographs and bits of history on display at the Father Damien Museum) helped me to fully appreciate the sacrifices made by Saints Damien and Marianne. If studying human suffering and sacrifice isn’t exactly what you have in mind for your hard-earned Hawaii vacation, I completely understand. I’ve never watched Schindler’s List for my birthday either. But if you’re a history buff, or if you happen to be walking past on your way to/from the beach, or if you get a rainy day and you’re looking for something dry to do, maybe that’s when you’ll want to stop in for a look. 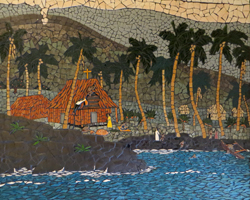 The stairway up to the Father Damien Museum showcases some lovely tile mosaics; and the rest of the exhibit is primarily photographs with a few artifacts. Photography is not allowed past the stairway, so I was not permitted to show you the exhibit itself. It could take you 30 minutes (plus or minus) to see the entire exhibit. Then, if you’re a fan of architecture like me, you might as well pop into the church next door to admire its design and stained glass artwork. The building's design is visually stunning! 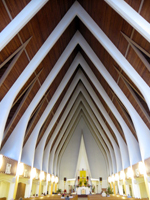 The photos at the top and bottom of this page, as well as the photo at left, were all taken inside the Saint Augustine by the Sea Church. Just remember that it is a place of worship. So if you only go to take photos, time your visit such that you won't disrupt those who are there with more spiritual intentions! 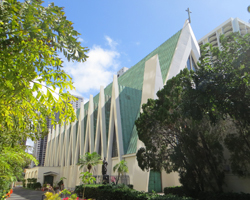 If you’re really into Hawaii history and/or free museums, the Father Damien Museum is located approximately one block from the Hawaii memorabilia collection at the Moana Surf Rider Hotel, which is approximately one block from the King’s Guard Museum, which is one block from the Lucoral Museum. You could see all these historic Hawaii attractions in a couple hours.